What I thought was the final lineup abruptly changed just a few days ago as Paradise International Music Festival announced another addition to their exciting list. Along with 8 international and 12 local acts, including Swedish DJ Afrojack, British band Rudimental (DJ), young American artist Austin Mahone, and headliner Kanye West, North Dakota rapper Wiz Khalifa confirmed his attendance to the music fest. Here are some of Wiz Khalifa's hits. Will he play these songs? What are your favorites from Wiz Khalifa? 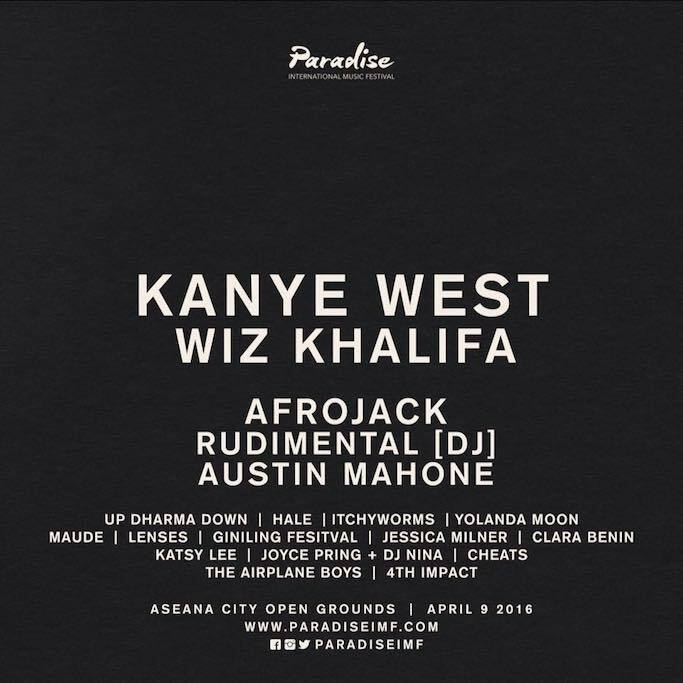 Paradise IMF will be held on April 9 at the ASEANA City Open Grounds in Parañaque City, under Boardworks Media Entertainment, a group renowned for bringing in international acts such as John Legend and Lifehouse.